No matter what happens, there's always "HOPE." Stunning image, Ginnie! I love that dark, foreboding sky. Yet, your processing expertly sets off the windmill! Ginnie Hart: I listen to so much going on in the world these days, Elizabeth, and wonder what we would do without Hope! Thank you. So cool. Looks like a watercolor painting. Ginnie Hart: You're reminding me, Peter, that there is always something bright to be found in the midst of the storm. Thank you. Ginnie Hart: I didn't have anyone specific in mind for this, Elaine, but now I will say it's just for YOU. A fine image... does the windmill tower turn? Ginnie Hart: Thank you, Larry. The tower doesn't turn...only the sails. Fabulous picture. I think this is one of the best I have seen of this windmill. The miller is at home, the door is open and by the sails I can see that the windmill was 'working'. Love the light buildings in the back. 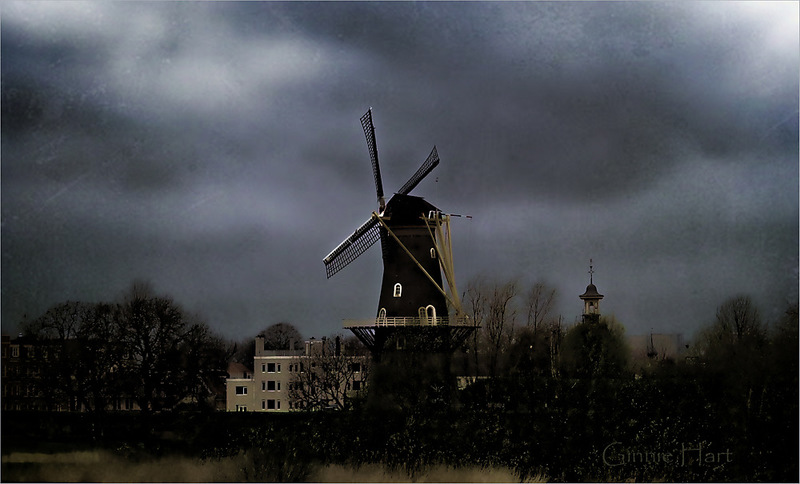 Ginnie Hart: This was on our way home from Fort Vuren, MLMA, and is a different view of the mill from what we usually see. Thank you for your kind words! Ginnie Hart: Thank you, kind sir. You've seen our Dutch skies, haven't you! Ginnie Hart: Most kind of you, Lisl. Thank you. Ginnie Hart: Thank you, Bill. I love it when that happens. Wow, very good processing!i like! Oh, waht a thgreatening sky - It will rain? A finely trated photo! 'De Hoop' is a windmill factory/business as I read- like you I love this name! Ginnie Hart: It is one of my favorite mills here in Dutchland, Philine, because of all the beautiful views to it on our citadel wall. You've seen it! Sorry: what a threatening ...treated...no delete button, sorry! Ginnie Hart: As I often say, Philine, I know your English. Ginnie Hart: I think we all like a little bit of drama in our lives, JP, from time to time, even if we hate to admit it. Merci. The light is captured on it very well Ginnie. Great sky too. What a fabulous picture Ginnie! The atmosphere is fantastic. Ginnie Hart: Thank you, Richard. I think we all like a bit of "attitude" from time to time, right? Ha ha... that will be your next windmill hunt, G! Ginnie Hart: I would love to see a rainbow in a windmill image, LC. I will definitely be on the hunt! That is good to know, Ginnie. I could use some hope. Absolutely love this photo. Ginnie Hart: Faith, hope and charity, Mary...always there for the taking! Thank you. A very strong image, Ginnie. Ginnie Hart: I really dramatized this, Janet, of course. It's never looked this threatening, I'm sure. My goodness there was some atmosphere building up there Ginnie, what a tremendous shot. Ginnie Hart: Thanks, Brian. I took much liberty to dramatize this more than it actually was that day. HA! A sky from Chris' shed? The whites of the windmill stands out. Great. So you are a semi-dutchy now. Five years already - can hardly believe it. Ginnie Hart: I did have to go "fetch" a sky, Louis. HA! And yes, indeed...5.5 years now! With my EU Long-term Resident card, I can now live anywhere in the EU. That part was news to me! Ginnie Hart: Thank you, dear Friend. I looks like a model! Somehow it makes me think of painted backdrop used in theatres. The clouds look very ominous. Ginnie Hart: It was fun to make this look like this, Alan! Ginnie Hart: I had fun making this image more dramatic than it originally was, Anne. The power of manipulation (as you know so well)! Ginnie Hart: You're right about being wrong, Sudipto. HA! This is one of our two citadel windmills where we live and it is definitely not haunted...as far as I know. I just had fun making it more dramatic. That is a stunning shot. Absolute perfection. Ginnie Hart: Thank you, Michael. Very kind of you. I love the treatment here, Ginnie. Well done. This may be my favorite of the windmills! Love it. Ginnie Hart: Thank you, Hollie. It may be mine, too. i like the strong contrasty look of this scene, nice shot. Ginnie Hart: Thank you kindly, Rian. It's good to see you again.